More than 700,000 people in the United States received organ transplants over the past three decades—an incredible number considering that just 60 years ago, it was virtually impossible to transplant tissue without it being violently, and usually fatally, rejected by a patient’s body. (The only successful transplants up to that point had been between identical twins.) It wasn’t until 1958 that Tufts professor and hematologist Robert S. Schwartz made them feasible by uncovering a medical means for suppressing the human immune response. Schwartz and Dameshek noted that under a microscope, the immune response involves a proliferation of cells—one that bears a striking resemblance to leukemia—and wondered whether it might be possible to chemically suppress it. Schwartz then contacted two pharmaceutical companies for samples of antileukemic drugs to test on rabbits. 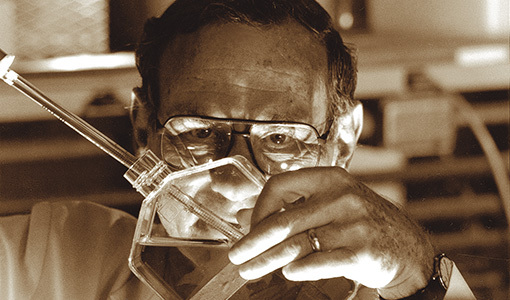 The first drug he administered, 6-mercaptopurine, suppressed the animals’ immune response, and Schwartz recalled “dancing in the lab” with a research fellow when they saw the evidence. Schwartz and Dameshek then co-wrote a series of papers in 1958 and 1959 definitively showing that using 6-mercaptopurine to temporarily shut off the immune system response at the time of transplantation could stop organ rejection. Their research quickly spawned other studies, with researchers in the U.S. and England using the drug to successfully transplant skin and kidneys in dogs and other animals. “It’s unusual to see a discovery have so much impact, to see a breakthrough change practice so profoundly for the better,” said John K. Erban, M81, a professor at Tufts University School of Medicine and the clinical director of Tufts Cancer Center. In 1962, doctors performed the first human kidney transplant using a deceased donor, and the first liver transplant followed a year later. In 1967, a heart transplant was successful. In 2000, the Transplantation Society awarded Schwartz its Medawar Prize, the field’s highest honor, and his outsized contributions to transplantation were also mentioned in two Nobel Prize speeches. And Schwartz didn’t stop at transplantation: In the 1960s, he applied his chemical immunosuppression knowledge to fight autoimmune disorders. Schwartz died last August, but the lessons learned from his research will live on in the treatment of cancer and other diseases. The Robert Schwartz, M.D. Scholarship, established in 2003, provides financial assistance for students at Tufts University School of Medicine. To make a donation to this fund, please visit go.tufts.edu/schwartz or call the TUSM Office of Development at 617-636-6770.